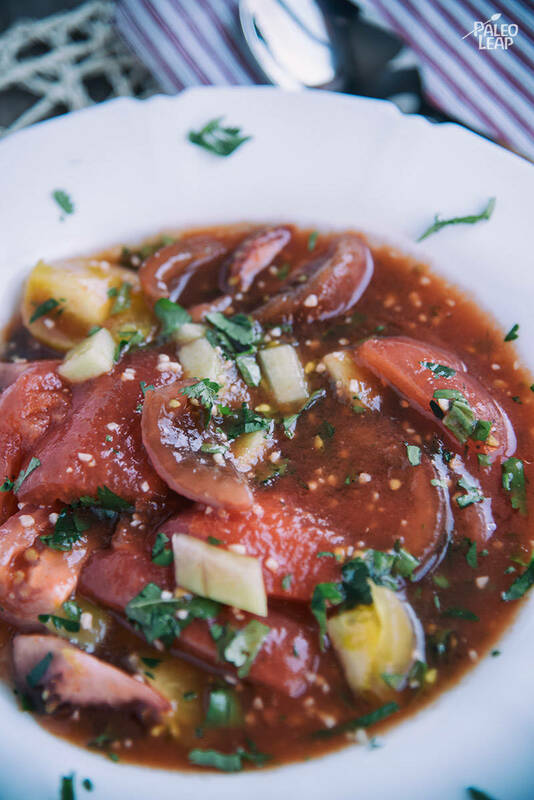 Many of us may have heard the term “gazpacho” in the past, but what is this dish exactly? The first thing to know is that this recipe is a Paleo and vegetarian-friendly soup, served cold. It’s very popular in Spain and Portugal, where it is often served during hot evenings as a tasty way of dealing with the heat. While the preparation for this dish certainly takes some time, you end up with a delicious and one-of-a-kind soup that works well for a light lunch or to accompany other dishes at dinner time. The focus of this dish is without a doubt the tomatoes – if you don’t like the flavor of these raw, this may not be the dish for you. However, if you love the flavor of tomatoes as much as we do, this soup is a perfect dish to add to your rotation of homemade meals. Since so much of the quality of this dish relies on the tomatoes you use, make sure to find the highest-quality produce that you can. Although the cost might be tempting, most standard tomatoes in grocery stores are extremely bland. If you’re limited to these options, aim for heirlooms or other varieties noted for their flavors, making sure to wait to make this recipe until they are very ripe. Traditionally, gazpacho is served with hard-boiled eggs or cooked ham, which is either diced and tossed into the recipe or served on the side. We think a great main course to serve with this dish is the homemade ham – just know the curing process for this takes a day per pound of ham you use. Bring a large pot of water to a boil over high heat. Carve tomatoes with a shallow x at the bottom of the tomatoes and place in a big bowl. Pour boiling water over tomatoes and let sit 2 to 3 minutes. Remove tomatoes from the water, reserving about 4 cups of water. Gently remove the skin off the tomatoes from the bottom x and chop the tomatoes into pieces. Pour the tomato juice, reserved water, lime juice, and balsamic vinegar into a saucepan. Add in the basil, parsley, cilantro, and garlic; season with salt and pepper to taste. Add in the diced tomatoes and cucumber, stirring well. © 2019 Paleo Leap, LLC. All rights reserved. For your information only. The statements on this website are merely opinions. Paleo Leap does not provide medical or nutritional advice, treatment or diagnosis. We recommend 3rd party products via affiliate links.